Fitting writing into my life is an ongoing battle - it seems. All the forces in my life seem to be opposed to me sitting down to actually write, and it is one of the things that I love to do. There are so very many distractions that seem to claim time on my life, and I am starting to get frustrated. All I can figure to do is to steal the time for myself, then I may be able to accomplish some of the tasks on my to do list. How am I going to do this? little writing retreat, and I am actually working. 2. I am going to make myself start getting up one hour earlier and staying up one hour later. That is really hard for me to do. I have such a hard time sleeping as is, but I am determined to get some of my writing done in my own quiet time, even if I have to steal a little sleep from myself. And who knows, perhaps I may start sleeping better if I am a bit more tired. 3. I have already stopped watching television and most movies. If I do have to sit down and watch a movie with my husband to "spend time" with him, I always have my laptop in front of me and work on projects. By doing this, it has freed up a few hours a week for me to write. 4. I have decided to take one weekend for myself to spend writing, and one weekend a month to spend recharging my spiritual / emotional batteries. My weekend writing is going to be either locked in my office and refusing to take calls or answer the door between set hours, or to head to a quiet place like the library, a hotel room, an atrium at a hotel, or someplace that is quiet where I can be alone with my thoughts. The two weekends a month that I don't have booked off on my calendar, I will gladly offer to all of those who need me. Sounds like a great plan to me. One thing I need to make sure I do is write these in on my calendar. My family knows I live by my calendar. If I have it scheduled in, then it will happen. I will schedule in my weekends and any other times I will be unavailable. As for the work hours, I am just telling everyone that I am working full time, then they know not to try to get in touch with me. When I get up early or stay up later, I will focus my time on writing and not get distracted by social media or other distractions. 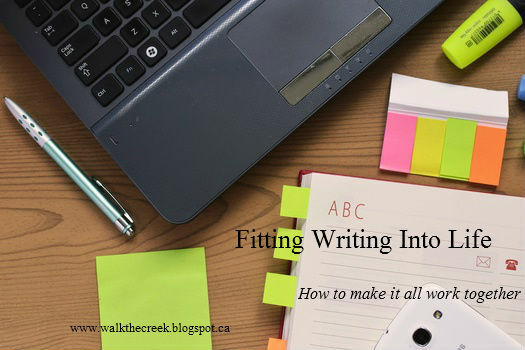 There are always ways to fit writing into our lives if we want it bad enough. I want it bad enough to incorporate these four ways into my schedule. It's going to make for a much more productive year. 2016 - the year to get some serious writing done for me!